The benefit of thrombectomy among patients with anterior circulation large vessel occlusion (LVO) stroke is unclear beyond 6 hours. Here we sought to ascertain whether or not successful thrombectomy is beneficial when performed in MR-selected patients more than 6 hours after stroke onset. A cohort of 30 LVO patients who underwent thrombectomy after MR selection between 11/1/2012 until 5/15/2015 was studied. Patients were selected for thrombectomy based on small diffusion-restricted core volume at presentation. Patients with decision to treat later than 6 hours from symptom onset and who achieved TICI≥2B recanalization (n=21) were compared against patients with failed thrombectomy (TICI<2B) at any time (n=9). Outcomes measures were final infarct volume and disposition from hospital. 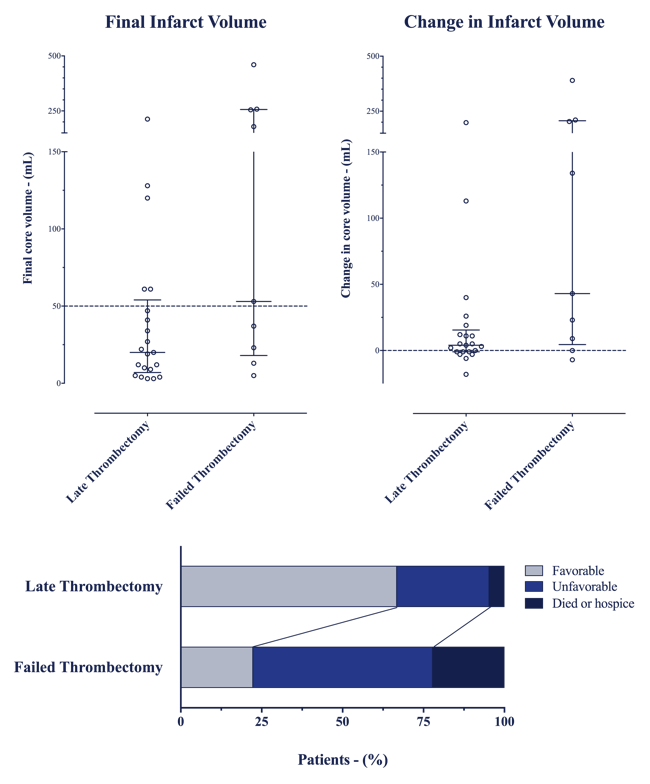 The median time from symptom onset to access for the successful late thrombectomy group was 10.6 h (IQR 7.8 – 14.4). 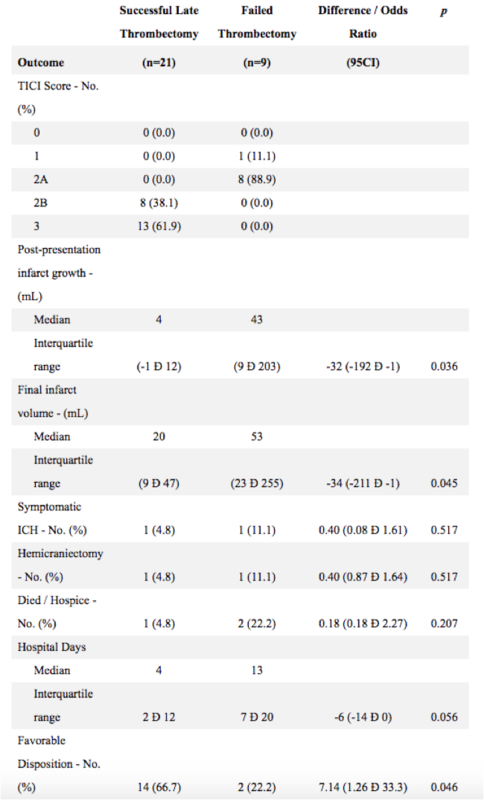 Compared with the failed intervention group, patients with successful late thrombectomy had smaller median final infarct volume (20 mL v. 53 mL, p = 0.045), less median infarct growth (+4 mL v. +43 mL, p = 0.036), and were more likely to be discharged home or to rehab (66.7% v. 22.2%, OR 7.14 [95% CI: 1.26 – 34.5]). Late MR-selected LVO patients had smaller final core volumes and superior in-hospital clinical outcomes after successful thrombectomy compared with similar patients who had failed or incomplete thrombectomy. Favorable outcomes were achieved well beyond 6 hours. Mechanical thrombectomy can markedly improve long-term outcomes after anterior circulation large vessel occlusion (LVO) stroke. (Jovin et al. 2015; Saver et al. 2015; Campbell et al. 2015; Goyal et al. 2015; Berkhemer et al. 2015) The success of recent clinical trials is attributed to the use of third generation thrombectomy devices and limiting intervention to patients with proximal large vessel occlusion as confirmed with advanced imaging, typically CT angiography. Most patients enrolled in these trials were treated at early time points. Although time is considered important, patient specific factors such as collateral status may also be key determinants of outcome. (Bang et al. 2011; Cheng-Ching et al. 2015) Significant unanswered questions pertain to the application of advanced imaging for patient selection and to the treatment of patients at extended time-points. At our institution LVO patients who present with small volume of restricted diffusion on MR screening are treated with thrombectomy regardless of time from onset. Small core volume in the presence of a proximal large vessel occlusion is a useful biomarker for the presence of significant collateral circulation and a predictor of good clinical outcome after thrombectomy. (Leslie-Mazwi et al. 2015) Utilizing small presentation core volume on MR screening as an indication for treatment we have intervened in patients out to 20 hours from stroke onset. This cohort presents a valuable opportunity to evaluate the performance of thrombectomy in selected patients at extended time-points. Here we compare final infarct volume and hospital discharge disposition among MR-selected patients with successful late thrombectomy versus similar patients with failed thrombectomy at any time to assess the benefit of intervention beyond the conventional 6-hour window. With IRB approval and oversight, we retrospectively identified 81 consecutive patients with acute ischemic stroke and large vessel occlusion who underwent mechanical thrombectomy at our institution between 11/1/2012 and 5/15/2015 from a prospective departmental acute stroke database. Patients with posterior circulation stroke, contraindication to MRI, cervical ICA dissection or stenosis preventing access, prior concordant stroke, or bilateral lesions were excluded, leaving 49 patients selected by MRI criteria for treatment of anterior circulation large vessel occlusion acute infarctions. 19 MR-selected patients with decision to treat within 6 hours and successful recanalization were not relevant to the question at hand and were excluded. In this way we arrived at our study group of 21 MR-selected patients with successful late thrombectomy (SLT; decision to treat beyond 6 hours plus TICI≥2B recanalization) and our control group of 9 MR-selected patients with failed thrombectomy (FT, decision to treat at any time point, early or late, plus TICI<2B) (Table 1). Patients presenting with acute ischemic stroke were evaluated and treated with for intravenous thrombolytic therapy if indicated in accordance with published guidelines. (Jauch et al. 2013) All with NIHSS score greater than 8 and selected patients with NIHSS less than 8 with significant aphasia were considered candidates for thrombectomy regardless of time from symptom onset. Each patient underwent CT or MR angiography to confirm large vessel occlusion followed by MRI (sequences: DWI, FLAIR, SWI, +/- perfusion) to assess presenting core infarct volume. The decision to treat was made by attending interventional neuroradiology and neurology staff at the time of MRI. On DWI, the presenting core infarct volume was measured in 3 orthogonal dimensions and the volume calculated according to the ABC/2 method. Patients were evaluated for intervention on a case by case basis but were generally considered candidates for intervention if the presentation diffusion restricted core volume was less than 70 mL and perfusion weighted sequences demonstrated salvageable ischemic penumbra, regardless of time from symptom onset. Mechanical thrombectomy was performed by an experienced interventional neuroradiologist, typically using a stent retriever in standard fashion, although three patients underwent clot aspiration. The choice of technique was made at the discretion of the treating interventionalist. Following the final thrombectomy attempt, recanalization was assessed on the TICI scale by digital subtraction angiography. Successful recanalization was considered to be TICI≥2B. Rates of complication were determined by systematic review of each patient’s inpatient record and diagnostic imaging. Post-intervention, noncontrast head CTs were obtained for all patients, and reviewed for the presence of reperfusion hemorrhage, new arterial distribution infarction and final infarct volume in a blinded fashion. The type and severity of reperfusion hemorrhage was determined from post-intervention noncontrast head CTs in accordance with published diagnostic criteria. Using the ABC/2 method, final infarct volumes were measured on CT or MR imaging from late in the admission (never less than 6 hours after thrombectomy). When post-intervention DWI was available these sequences were used to determine the final infarct volume. Since a large proportion of patients were missing discharge NIHSSS (57%) or 90-day modified Rankin scores, alternative clinical outcome variables were used. Detailed discharge dispositions were determined by review of the patient’s clinical record. All of the dispositions were sorted into one of three ordinal discharge disposition outcomes: favorable, unfavorable, or death, as follows. Patients discharged home or to rehab or transferred to another hospital with normal mental status and minor deficits were considered to have had a favorable disposition. Patients transferred to a skilled nursing facility, a long-term acute care facility, another hospital intubated or with major deficits were considered to have had an unfavorable disposition. Death or hospice was the third and final ordinal discharge disposition outcome. Comparisons were made between patients with successful recanalization (defined as post procedure TICI≥2B) after decision to treat beyond 6 hours of symptom onset and those with failed recanalization (defined as post procedure TICI<2B) at any time point. Demographics, medical history, clinical, and radiographic features were summarized groupwise (Table 1). Adverse events, final infarct volume, change in infarct volume, discharge disposition, and ordinal discharge disposition (favorable, unfavorable, died / hospice) were compared for the same (Table 2). The Pearson Χ2, Fisher’s exact, and Mann Whitney U tests were applied as indicated. All statistical analysis was performed using IBM SPSS software. Confidence intervals were computed using a 1000 sample un-stratified resampling model. All patients showed proximal large vessel occlusion with NIHSSS from 11-19 and a presenting core infarct volume less than 50 mL on DWI. Compared to the failed thrombectomy (FT) group, the successful late thrombectomy (SLT) group is notable for higher fraction of left-sided stroke (67% v. 33%), lower fraction of IV tPA (19% v. 56%) and later median time to CTA (8.7h v. 4.7h) and access (11h v. 7.3h), but the groups are otherwise quite comparable with respect to presenting characteristics (Table 1). Compared to patients in the FT control group, those in the SLT group showed significantly smaller median final infarct volume, 20 mL v. 53 mL (estimated difference -34 mL [95CI: -211 – -1]), and smaller median post-presentation infarct growth, +4 mL v. +43 mL (estimated difference -32 [95CI: -192 – -1]) (Table 2, Figure 1a, 1b). Rates of adverse events including symptomatic ICH, hemicraniectomy, and all cause mortality were not significantly different between the two groups. The rate of any hemorrhagic conversion observed among patients who presented beyond 6 hours and had successful recanalization was 2/21 (9.5%), whereas only 1/21 patients had a symptomatic hemorrhagic conversion (4.8%), (Table 2). Patients in the SLT group were also more likely to have a favorable discharge disposition. A favorable discharge outcome was observed in 14/21 (66.7%) patients with successful late recanalization versus only 2/9 (22.2%) patients with a failed recanalization (odds ratio 7.14 [95CI: 1.26 – 34.5]), (Table 2, Figure 1b, 1c). A trend toward shorter median length of stay was also observed in the SLT group, 4d v.13d (estimated difference -6 [95CI: -14 – 0]), (Table 2). MR-selected patients with acute stroke and large vessel anterior circulation occlusions are likely to benefit from successful late thrombectomy. Favorable outcomes were observed with thrombectomies performed up to 20 hours from symptom onset. Compared with similar patients who had a failed thrombectomy at any time, patients with successful late thrombectomy had smaller completed infarct volumes, were more likely to be discharged home or to rehab, tended to have shorter hospital stays and were less likely to die inpatient. Final infarct volume is a validated indicator of 90 day mRS,(Albers et al. 2015; Yoo et al. 2012; Thijs et al. 2000) and the majority (76.2%) of late MR-selected patients in this cohort who achieved TICI≥2B had final infarct volumes less than 50 mL, indicating a reasonable chance for an independent clinical outcome at 90 days. (Yoo et al. 2012) Adverse events, including symptomatic intracranial hemorrhage, were rare and occurred with similar frequency in both treatment groups. The TICI≥2B recanalization rate was similar among both early and late MR-selected candidates (79.2% early, 84.0% late). Our study adds to the growing body of work indicating that failure to achieve reperfusion portends an unfavorable outcome after a proximal large vessel occlusion infarction, and complements recent trials(Campbell et al. 2015; Goyal et al. 2015; Saver et al. 2015; Jovin et al. 2015; Berkhemer et al. 2015) by showing that the benefits of thrombectomy may extend well beyond the conventional 6 hour treatment window in MR-selected patients. Our study differs most significantly from these recent positive trials in the implementation of MR screening for patient selection. In a recent observational study of MR screening for proximal large vessel occlusion stroke Leslie-Mazwi et al. demonstrated that MR screening by assessment of presentation core infarct was a reliable method for predicting favorable outcomes after thrombectomy. (Leslie-Mazwi et al. 2015) Our results support these findings and complement them by adding experience with additional late patients. Although time to presentation is considered important, numerous observational studies have failed to demonstrate a linear relationship between time and final infarct volume. (Schaefer et al. 2015; Copen et al. 2009; Leslie-Mazwi et al. 2015; González et al. 2013) Cheng-Cheng and others have previously demonstrated that patient collateral status, not time, is the primary determinant of infarct volume after stroke. (Cheng-Ching et al. 2015; Nicoli et al. 2014; Menon et al. 2011; Nambiar et al. 2014) Our results are in line with these findings and support the hypothesis that the nature of stroke evolution may be less time dependent than previously assumed. A few patients had small final infarct volumes despite failed recanalization. Eight of nine patients in the FT group did achieve TICI 2A recanalization and it is possible that this conferred enough benefit to prevent secondary infarct growth in some cases. Additionally, we suspect that those with poor recanalization but small final infarct volume may represent a subgroup who developed arterial occlusion gradually such as from progressive intracranial atherosclerotic disease (ICAD), thus allowing for the chronic development of superior collateral circulation. At present it is difficult to reliably discriminate ICAD from acute embolic occlusions clinically. However due to fundamentally different pathophysiology, this subgroup is probably less likely to receive additional benefit from thrombectomy compared with best medical management. Our work has limitations inherent to a single center retrospective observational study. The decision to treat was made by clinicians at the time of service and there was no randomized control group. Outcomes were inferred based on final infarct volume, which is a validated correlate to 90-day mRS,(Albers et al. 2015; Yoo et al. 2012; Thijs et al. 2000) and clinical observations available in the medical record, however the preferred clinical outcome, 90-day mRS, could not be quantified in this cohort. The ideal selection strategy remains to be determined however it is clear that with MR selection candidates likely to benefit from embolectomy can be identified regardless of time from onset and that such a treatment strategy is likely to result in the successful treatment of additional late patients who have a reasonable chance of benefit from thrombectomy. 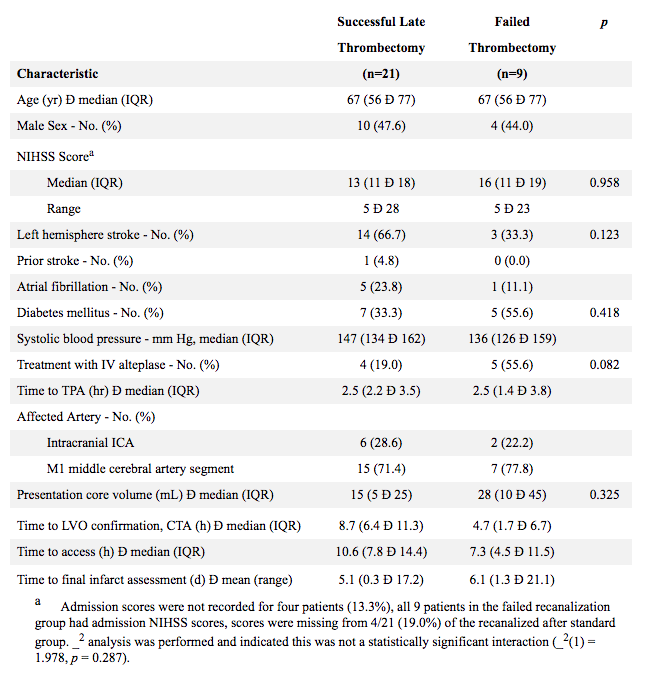 After MR selection, successful thrombectomy for LVO performed up to 20 hours from symptom onset is likely beneficial compared with no intervention. Good candidates for thrombectomy can be identified by low volume of diffusion-restricted core infarct on presentation MR screening. Employing a patient-specific, MR selection strategy may facilitate the identification and treatment of additional late candidates likely to benefit from intervention. Figure 1. Outcomes after successful late thrombectomy. Horizontal bars indicate median and interquartile range. a. Final infarct volume; dashed line = 50 mL. b. Post-presentation infarct growth; dashed line = no growth. c. Ordinal discharge disposition. Albers, Gregory W, Mayank Goyal, Reza Jahan, Alain Bonafe, Hans-Christoph Diener, Elad I Levy, Vitor M Pereira, Christophe Cognard, Dileep R Yavagal, and Jeffrey L Saver. 2015. “Relationships Between Imaging Assessments and Outcomes in Solitaire with the Intention for Thrombectomy as Primary Endovascular Treatment for Acute Ischemic Stroke..” Stroke 46 (10): 2786–94. doi:10.1161/STROKEAHA.115.010710. Bang, O Y, J L Saver, S J Kim, G M Kim, C S Chung, B Ovbiagele, K H Lee, and D S Liebeskind. 2011. “Collateral Flow Predicts Response to Endovascular Therapy for Acute Ischemic Stroke.” Stroke 42 (3): 693–99. doi:10.1161/STROKEAHA.110.595256. Berkhemer, Olvert A, Puck S S Fransen, Debbie Beumer, Lucie A van den Berg, Hester F Lingsma, Albert J Yoo, Wouter J Schonewille, et al. 2015. “A Randomized Trial of Intraarterial Treatment for Acute Ischemic Stroke.” The New England Journal of Medicine 372 (1): 11–20. doi:10.1056/NEJMoa1411587. Campbell, Bruce C V, Peter J Mitchell, Timothy J Kleinig, Helen M Dewey, Leonid Churilov, Nawaf Yassi, Bernard Yan, et al. 2015. “Endovascular Therapy for Ischemic Stroke with Perfusion-Imaging Selection.” The New England Journal of Medicine 372 (11): 1009–18. doi:10.1056/NEJMoa1414792. Cheng-Ching, E, J A Frontera, S Man, J Aoki, Y Tateishi, F K Hui, D Wisco, P Ruggieri, M S Hussain, and K Uchino. 2015. “Degree of Collaterals and Not Time Is the Determining Factor of Core Infarct Volume Within 6 Hours of Stroke Onset..” American Journal of Neuroradiology 36 (7): 1272–76. doi:10.3174/ajnr.A4274. Copen, William A, Leila Rezai Gharai, Elizabeth R Barak, Lee H Schwamm, Ona Wu, Shahmir Kamalian, R Gilberto González, and Pamela W Schaefer. 2009. “Existence of the Diffusion-Perfusion Mismatch Within 24 Hours After Onset of Acute Stroke: Dependence on Proximal Arterial Occlusion..” Radiology 250 (3): 878–86. doi:10.1148/radiol.2503080811. González, Ramon Gilberto, William A Copen, Pamela W Schaefer, Michael H Lev, Stuart R Pomerantz, Otto Rapalino, John W Chen, et al. 2013. “Rapid Identification of a Major Diffusion/Perfusion Mismatch in Distal Internal Carotid Artery or Middle Cerebral Artery Ischemic Stroke | BMC Neurology | Full Text.” Journal of … 5 Suppl 1: i7–i12. doi:10.1136/neurintsurg-2013-010715. Goyal, Mayank, Andrew M Demchuk, Bijoy K Menon, Muneer Eesa, Jeremy L Rempel, John Thornton, Daniel Roy, et al. 2015. “Randomized Assessment of Rapid Endovascular Treatment of Ischemic Stroke.” The New England Journal of Medicine 372 (11): 1019–30. doi:10.1056/NEJMoa1414905. Jauch, E C, J L Saver, H P Adams, A Bruno, J J Connors, B M Demaerschalk, P Khatri, et al. 2013. “Guidelines for the Early Management of Patients with Acute Ischemic Stroke: a Guideline for Healthcare Professionals From the American Heart Association/American Stroke Association.” Stroke 44 (3). Stroke: 870–947. doi:10.1161/STR.0b013e318284056a. Jovin, Tudor G, Angel Chamorro, Erik Cobo, María A de Miquel, Carlos A Molina, Alex Rovira, Luis San Román, et al. 2015. “Thrombectomy Within 8 Hours After Symptom Onset in Ischemic Stroke.” The New England Journal of Medicine 372 (24): 2296–2306. doi:10.1056/NEJMoa1503780. Leslie-Mazwi, Thabele M, Joshua A Hirsch, Guido J Falcone, Pamela W Schaefer, Michael H Lev, James D Rabinov, Natalia S Rost, Lee Schwamm, and R Gilberto González. 2015. “Endovascular Stroke Treatment Outcomes After Patient Selection Based on Magnetic Resonance Imaging and Clinical Criteria.” JAMA Neurology, 1–7. doi:10.1001/jamaneurol.2015.3000. Menon, B K, E E Smith, J Modi, S K Patel, R Bhatia, T W J Watson, M D Hill, A M Demchuk, and M Goyal. 2011. “Regional Leptomeningeal Score on CT Angiography Predicts Clinical and Imaging Outcomes in Patients with Acute Anterior Circulation Occlusions..” American Journal of Neuroradiology 32 (9): 1640–45. doi:10.3174/ajnr.A2564. Nambiar, V, S I Sohn, M A Almekhlafi, H W Chang, S Mishra, E Qazi, M Eesa, et al. 2014. “CTA Collateral Status and Response to Recanalization in Patients with Acute Ischemic Stroke..” American Journal of Neuroradiology 35 (5): 884–90. doi:10.3174/ajnr.A3817. Nicoli, F, F Scalzo, J L Saver, F Pautot, A Mitulescu, Y Chaibi, N Girard, N Salamon, D S Liebeskind, UCLA Stroke Investigators. 2014. “The Combination of Baseline Magnetic Resonance Perfusion-Weighted Imaging-Derived Tissue Volume with Severely Prolonged Arterial-Tissue Delay and Diffusion-Weighted Imaging Lesion Volume Is Predictive of MCA-M1 Recanalization in Patients Treated with Endovascular Thrombectomy..” Neuroradiology 56 (2): 117–27. doi:10.1007/s00234-013-1310-2. Saver, Jeffrey L, Mayank Goyal, Alain Bonafe, Hans-Christoph Diener, Elad I Levy, Vitor M Pereira, Gregory W Albers, et al. 2015. “Stent-Retriever Thrombectomy After Intravenous T-PA vs. T-PA Alone in Stroke.” The New England Journal of Medicine 372 (24): 2285–95. doi:10.1056/NEJMoa1415061. Schaefer, P W, B Pulli, W A Copen, J A Hirsch, T Leslie-Mazwi, L H Schwamm, O Wu, R G Gonzalez, and A J Yoo. 2015. “Combining MRI with NIHSS Thresholds to Predict Outcome in Acute Ischemic Stroke: Value for Patient Selection.” American Journal of Neuroradiology 36 (2): 259–64. doi:10.3174/ajnr.A4103. Thijs, V N, M G Lansberg, C Beaulieu, M P Marks, M E Moseley, and G W Albers. 2000. “Is Early Ischemic Lesion Volume on Diffusion-Weighted Imaging an Independent Predictor of Stroke Outcome? a Multivariable Analysis..” Stroke 31 (11): 2597–2602. Yoo, A J, Z A Chaudhry, R G Nogueira, M H Lev, P W Schaefer, L H Schwamm, J A Hirsch, and R G Gonzalez. 2012. “Infarct Volume Is a Pivotal Biomarker After Intra-Arterial Stroke Therapy.” Stroke 43 (5). Stroke: 1323–30. doi:10.1161/STROKEAHA.111.639401.